I was the first media outlet to call out LVMPD Police Officer Cordell Hendrex for what he is; a coward who failed to act to save lives on October 1, 2017. In the wake of the Hendrex incident, the Baltimore Post-Examiner has learned from law enforcement sources, that Hendrex may not be the only coward cop who was on duty that night. The Baltimore Post-Examiner was told that the police officer who was given the rifle by the sergeant has since received a reprimand because he was not authorized to possess the rifle. The sergeant was also in violation of department policy for giving his rifle to the patrol officer. Abandonment of post specifically during a life-threatening incident is a serious violation of any police department’s policy. On Monday the Baltimore Post-Examiner sent a media request for comment to the LVMPD Public Information Office and also requested the name of the sergeant and the police officer involved. As of Tuesday evening, the LVMPD did not respond to our request. Retired LVMPD Lt. Norm Jahn told the Baltimore Post-Examiner on Tuesday, “Looking toward improvement and acceptance of the realities…police departments across the country (starting with the LVMPD) should ‘build in’ to their pre-plans and response plans the calculation that all officers will NOT approach gunfire for many reasons. It is a FACT of life that has become apparent a few times now. We better have backup plans or redundancy to try to address this. Mandalay was NOT Mumbai, but the mass confusion should be expected for the next one. There are lots of ‘roles’ to be filled and not everyone is capable or willing to be the ‘hero’. “It could have been made clear much earlier that this was a ‘sniper’ incident. Dispatch should not be broadcasting ‘possible shooter’ or ‘active shooter’ unless a police officer is a witness to the violence…not just people who show up with wounds. Terminology matters. A proper understanding matters because it dictates the police response,” Jahn said. 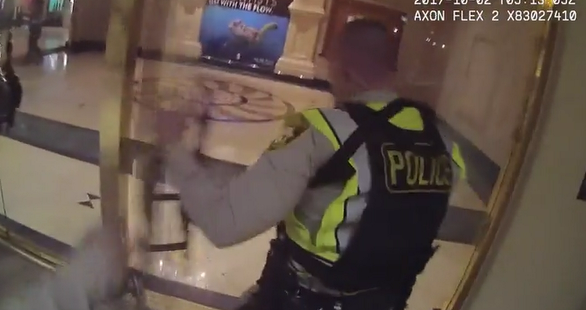 A retired LVMPD SWAT officer told the Baltimore Post-Examiner that during an active shooter incident you, “find him, kill him.” Sometimes, “You have to draw the fire towards yourself,” to protect the public he said. My question is, what could this small group of armed officers and security personnel have done differently? To begin, what they could have done was not cower in the hallway on the floor below while innocent people were being gunned down. Next, they could have and should have moved to the threat immediately…it was their job as law enforcement officers and armed Mandalay Bay security to draw fire away from civilians. They were all authorized to carry firearms which would indicate that they have special training and are armed for situations such as this. Any actions the officers would have taken could have and would have disrupted Paddock’s indiscriminate firing on the crowd. Their actions would have been beneficial and without a doubt, potentially saved lives. In every active shooter event, police and security are at a disadvantage. Rarely are first responders properly prepared and have all the necessary training and equipment for these situations. The national approach (even prior to Oct.1) to an active shooter event is, YOU GO to the threat. Don’t wait for SWAT, just go. Do we need to be tactically sound, of course, but there isn’t time to make a full assault plan while innocent people are being killed? Officers and armed security have weapons for a reason. I watched as hiring standards plummeted over the years. Most Southern California cops, these days, have never been in a physical altercation. Schools have a zero tolerance rule which mandates suspensions or expulsions for the slightest schoolyard scuffle. The new hires go through academy training and hit the street with the ‘tapout’ mentality, only to discover real crooks don’t play by those rules. Couple that with the AYSO upbringing (everybody gets a chance, and everybody gets promoted) and you now have a workforce of disasters waiting to happen. ‘Warriors’ –0. ‘Fire Watchers’ –5.